Implement the service: The first section focuses on creating and exposing a service. Implement the client: Shows how to invoke the service using the MessagingTemplate class. Abstracting SI logic: Finally, I’ve added another section explaining how to implement the same client abstracting all Spring Integration code. Hence, leaving the client focused on its business logic. You can get the source code at my Github repository. Inbound gateway: Brings a message into the application and waits for a response. Outbound gateway: Invokes an external system and sends the response back to the application. In this example, we are using a RMI inbound gateway. It will receive a message over RMI and send it to the requestEmployee channel, which is also defined here. Finally, the service activator allows you to connect a spring bean to a message channel. Here, it is connected to the requestEmployee channel. The message will arrive to the channel and the service activator will invoke the retrieveEmployee method. Take into account that the ‘method’ attribute is not necessary if the bean has only one public method or has a method annotated with @ServiceActivator. The response will then be sent to the reply channel. Since we didn’t define this channel, it will create a temporary reply channel. The client uses the messagingTemplate to convert the Integer object to a Message and send it to the local channel. As shown below, there’s an outbound gateway connected to the local channel. This outbound gateway will send the request message over RMI. It uses the MessagingTemplate, which is a SI class. In this section, I will implement this same example abstracting the messaging logic, so the client will only care about its business logic. We can see now that the client just implements its business logic, without using neither message channels nor messaging template. It will just call the service interface. All the messaging definitions are in the configuration file. What we did here is add a gateway that will intercept calls to the service interface EmployeeService. Spring Integration will use the GatewayProxyFactoryBean class to create a proxy around the service interface. 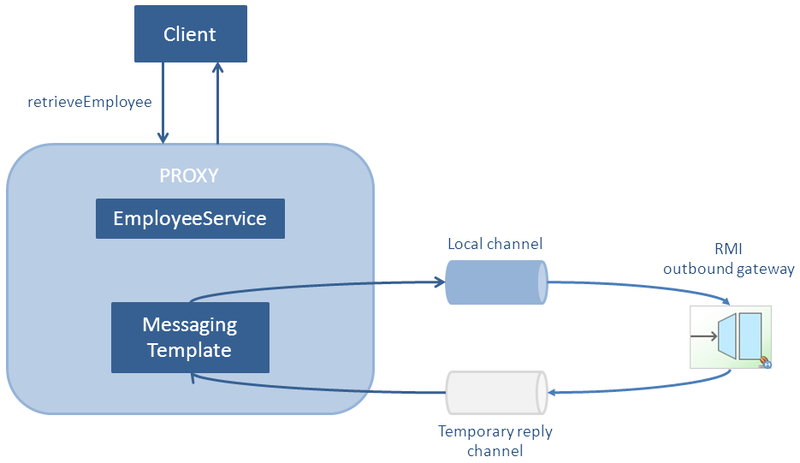 This proxy will use a messaging template to send the invocation to the request channel and wait for the response. We have seen how to use Spring Integration to access a service over RMI. We have also seen that we can not only explicitly send messages using the MessagingTemplate but also do it transparently with GatewayProxyFactoryBean.